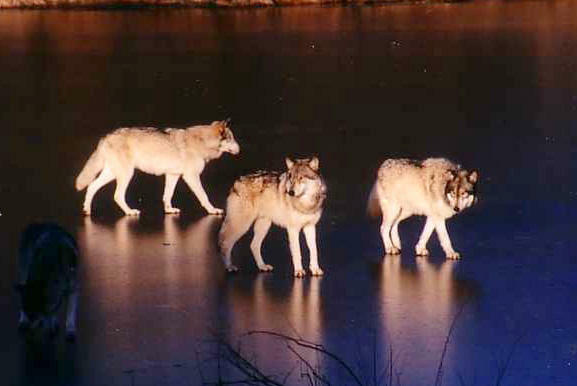 Wisconsin’s second wolf hunt reaches a turning point December 2. Licensed hunters can now use up to six dogs to help track wolves. Wisconsin is the only state to allow the practice. Some celebrate the rules and others take to court. Lucas Withrow started hunting with his dad years ago. Hunting with dogs runs deep in their family tradition. Today, Withrow raises and trains more than a dozen dogs on his property in Brodhead. Hunting bear is Withrow’s passion. Eight years ago, he joined the Wisconsin Bear Hunters Association and now represents the group on the DNR’s wolf advisory committee. Withrow says dogs will serve a valuable function in helping manage the state’s wolf population. Withrow rebuts criticism that the practice subjects dogs to potential violent injury or death. “Allowing dogs to get torn up by wolves for the enjoyment of their owners, seeking to pursue wolves in this fashion, violates animal cruelty law,” Jodi Habush Sinykin says. She is a Milwaukee attorney and represents a collection of humane societies, conservation groups and what she calls, “mainstream hunters.” She successfully took the issue to court. Sinykin argued that the DNR failed to write rules to protect hounds used in hunting wolves. At least during Wisconsin’s inaugural wolf hunt in 2012 – a judge issued an injunction against the use of dogs. The lawsuit now rests in the hands of the state court of appeals. Sinykin has been awaiting a decision for weeks. For those years, hunting wolves was illegal in Wisconsin because their numbers were scarce. During that time, if a wolf killed a dog, the state reimbursed the owner. Now that wolves have shifted to 'hunt and trap status', the state will not compensate hunters, if their hounds are killed during the chase. We may not find out how many dogs are killed during the hunt. The DNR wants hunters to report dog casualties, but they are not required to do so. The season will end on February 28 or when hunters take the state quota of 251. Tuesday the second wolf hunt season in Wisconsin commences. In the meantime, scientists continue to probe the complexities of balancing conservation and human’s varied interest and tolerance of the animal. WUWM environmental reporter Susan Bence interviews UW researcher Adrian Treves about the fate of gray wolves in Wisconsin. A UW researcher is growing increasingly concerned about the plight of the gray wolf on Wisconsin’s landscape. What Do Wisconsinites Think of a Second Wolf Hunt? WUWM environmental reporter Susan Bence interviews UW Madison researchers Adrian Treves and Lisa Naughton on public attitudes toward the state's wolf policy. The clock is ticking ever closer to Wisconsin’s “still hotly debated” second wolf harvest. A few days ago, volunteers and DNR staff tallied how many wolves populate the Wisconsin landscape. Their preliminary count is more than 800, living in 216 packs. Today, officials will use that information to begin to craft this year’s harvest quota. By June the Wisconsin Department of Natural Resources will set its quota for the upcoming wolf hunt season, which will kick off October 15. It will mark Wisconin's second wolf hunt season after the wolf was removed from federal endangered protection.